Race 3 of the Sperrin Harriers Winter League Trail Series took place on Saturday 12th January with 170 competitors taking on the challenge of the An Creagan 5 Mile. Situated on the top of the Sperrins between Omagh and Cookstown the An Creagan trail is a challenging course, thankfully the weather did not add any more challenges as it provided perfect running conditions. A strongly contested race saw many finishers run under 30 minutes and it was Eoin Hughes (Acorns AC) who produced another great performance to lead from start to finish, winning in a time of 27.24. Connor Reid (Ballymena Runners) finished second in 28.22 with Seamus Bradley (Unattached) completing the podium in 28.23. Springwell RC had three ladies at the event where Karen McLaughlin finished 5th in 35.23 and Sarah Dickinson was 28th in 41.33, just a couple of steps ahead of Carolyn Crawford who was 29th in 41.35. The East Antrim Marathon Series hosted the latest of their Marathons on Sunday 13th January to celebrate World Half Marathon Day. Springwell RC’s Helena Dornan once again out her marathon experience to good effect to finish third in a time of 4.02.39. The Mathieson Cup, hosted by Mallusk Harriers at the City of Belfast Playing Fields, took place on Sunday 13th January. The 8km race consisted of four laps of the grounds with runners enjoying the benefits of a gale force wind on their backs on the outward stretch before making their best efforts to achieve aerodynamic perfection, as they fought against the headwind on the return. Mark McKinstry (North Belfast Harriers) produced another outstanding performance to dominate the race from start to finishing, winning in a time of 24.31. North Belfast Harriers claimed all the podium positions with John Black second in 26.11 and Conal McCambridge third with a time of 26.34. 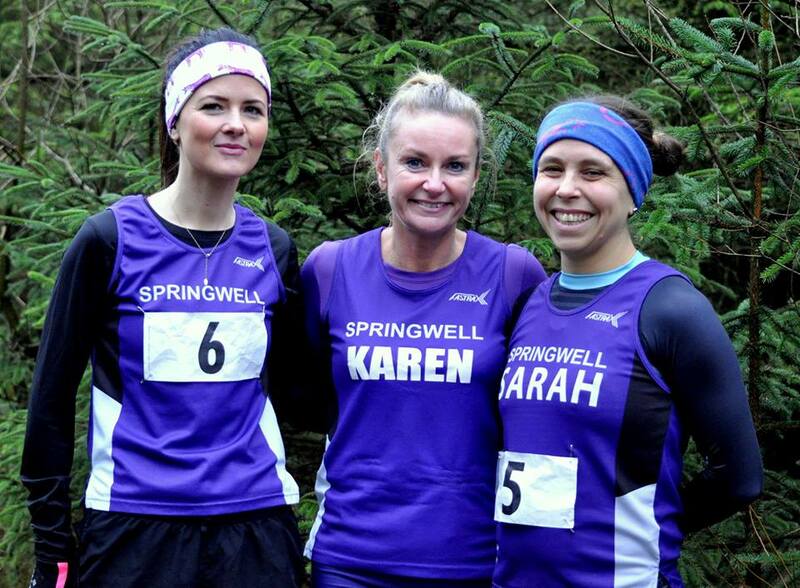 Springwell RC had one representative in the 6km Senior Ladies race America Aznar finished 18th in a time of 25.02. America Aznar at the Mathieson Cup XC.